$39 - $50 Roses Different color roses symbolize different meanings. FlowerFresh has expert in-house floral designers that create an array of different and unique flower designs to suit every occasion. We have an eclectic selection of birthday roses, our yellow rose bouquet is a favorite for birthdays and anniversaries. We pride ourselves on our floral presentation, and we put as much care into arranging a dozen red roses as we do an elegant pink rose arrangement. 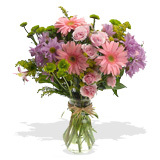 Every flower is arranged with the utmost care at FlowerFresh.